I spent an afternoon watch Netflix and creating 7 pocket cards in my little office. 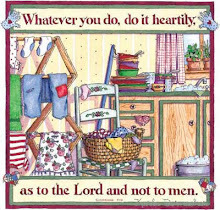 I still have plenty of images to recycle from an old Mary Engelbreit page a day calendar so I'll be making more. My other postes about my Mary Engelbreit pocket cards are ME Pocket Cards: Part 1 and ME Cards Pocket: Part 2 that I made to use in my mini books or mixed media art journals.